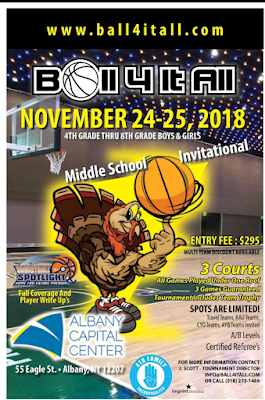 BASKETBALL SPOTLIGHT NEWS: Basketball Spotlight Headed To Albany, NY! Basketball Spotlight will be traveling to Albany, NY to cover the Ball 4 It All Middle School Invitational. These games will be played under one roof at Albany Capital Center and give us a chance to many new fresh faces. The tournament details are below.